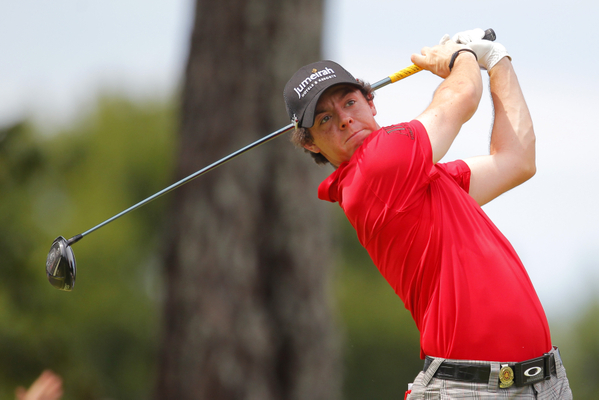 Rory McIlroy joined Tiger Woods as a winner on the first weekend of December. Photo copyright Icon SMI. Based on the results of last weekend, the 2012 season looks like it could be very interesting. In California, Tiger Woods won for the first time in just over two years at his own Chevron World Challenge. An unofficial, 18-player event, to be sure, but at this point any ‘W’ is a good one for Woods—and a positive sign for what lies ahead. In Hong Kong, Rory McIlroy scored a European Tour victory. In South Africa, Lee Westwood won the Nedbank Challenge, a 12-player event that was the international version of the Chevron. That’s victories for two former No. 1 players (Woods and Westwood) and the current No. 2/maybe future No. 1 (McIlroy). And wins for the two players who move the needle more than any others (Woods and McIlroy). Here’s the kicker: McIlroy and Westwood both announced recently that they will be joining the PGA Tour next year. And here’s another kicker: Sergio Garcia won a couple of European Tour events this fall, and he could be a factor in 2012, too. Luke Donald is going to have some serious competition next year as he tries to maintain the No. 1 spot on the world ranking. The major championships could be compelling, and so, dare I say it, could be the FedExCup. Nineteen of the top 20 players on the world ranking are now PGA Tour members (all except Martin Kaymer). Donald will also have some competition at this week’s Dubai World Championship as he tries to wrap up the European Order of Merit instead of it being a walkover. McIlroy’s Hong Kong victory gave him somewhat of a chance—but he has to win and have Donald finish in a tie for ninth or worse. So it still looks good for Donald to sweep the European and PGA Tour money lists. A McIlroy victory also would give him a case as international Player of the Year. Until a few weeks ago, his U.S. Open triumph was his lone victory of the year but he has since added the Shanghai Masters (an unofficial, limited-field event) and Hong Kong. Donald has four international wins (two each in Europe and the U.S.), one or probably both money titles, and the most world ranking points in 2011. But McIlroy holds a very good trump card with a major title. McIlroy’s victory came on the 10th week of a hectic 12-week schedule that has taken him from Scotland to Korea to China to Bermuda to Turkey (weekend rest after the 36-hole Grand Slam of Golf) to China for two weeks to the Maldives (where he took a two-week break) to China to Japan (for an exhibition) to Hong Kong to Dubai and then to Thailand next week. “It’s probably something that I won’t do again,” admitted McIlroy, whose schedule, as you might have guessed, was influenced by the opportunity to collect appearance fees. But while he said his “energy levels were down” after the second round in Hong Kong, McIlroy overcame fatigue to win with a final-round 65 that included holing a bunker shot on the final hole for a two-stroke margin. It was an important win for the Northern Iriishman who, except for the U.S. Open, has had trouble closing out tournaments. The victory was just the fourth official one of his career—pretty good for a 22-year-old but not a large number considering how often he has been in contention. If McIlroy was over-golfed, Woods—even more in need of a win after a two-year drought—had the opposite problem as he has been under-golfed in 2011 due to injuries and then missing the FedExCup. But he had sharpened his game by playing two of the last three weeks in the Australian Open and the Presidents Cup. Woods wasn’t quite ready at the Australian Open, where he lost the 36-hole lead. The same thing happened at the Chevron World Challenge, except this time he rallied in the final round and birdied the last two holes for a one-stroke victory over Zach Johnson. That finish was vintage Woods, promising a likely return to the official winner’s circle in 2012. Is he all the way back? We’ll know better when 2012 plays out. For Woods, that starts in late January in Abu Dhabi—a tournament that will probably also feature McIlroy. Woods trying to get back to No. 1 at the same time McIlroy is trying to get there? Yes, 2012 could be special.